If you wish to save money, eat well and not spend a lot of time cooking and shopping why not plan your meals in advance? By buying in bulk and making plans your money will go further and you will always have food in the house. Make a list of all the foods that you like. If you are on a diet or restricted diet because of a health problem make sure that the foods listed are suitable for your needs. Read through your recipes books for any recipe that you have made and enjoyed. Add the ingredients to your list and keep a copy of the recipe to hand. If you belong to a slimming club check the magazines and booklets that are given to you for tasty meal ideas and add these to the list as well. Next mark a diary or calendar with when you wish to eat the chosen meals. Also mark any events coming up that you will be expected to supply food for and add this to the calendar as well. Some meals will have the same meat or vegetable base so why not cook these all at the same time and put them in the freezer? Either that or cook several portions at the same time. Meals such as Bolognese sauce, curry, casseroles and braised steak are ideal for freezing. By making a larger casserole with the same amount of meat but extra vegetable you will find that the meal spreads over more days and saves you money. Freezing food is very easy to do. Make sure any containers are clean and the food is cold. Place portions in the containers, label the container with the contents and the date it was frozen and simply place into the freezer. If you are freezing a lot of fresh food then turn on the fat freeze section for a while but normally one or two containers of food will freeze down fairly quickly without using the feature which will generate more electricity and cost money. When you wish to use a frozen meal simply remove to from the freezer in the morning, leave to defrost and heat through at dinner time. Alternatively use your microwave to cook any prepared meal from frozen. Add a few steamed vegetables and you have a healthy meal in next to no time. Even if you do not wish to freeze food ahead of time by making lists of meals and shopping either once each week or on line once each week you will resist the urge to impulse buy and will eat nutritiously without wasting money. By saving money on your food bills you can afford to treat yourself every so often with a better cut of meat or perhaps a meal in a restaurant as a treat. 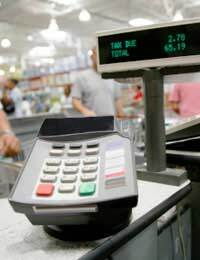 Treat your shopping efforts as a challenge to save money rather than a necessity. If shopping is thought of as a challenge to beat the people who increase prices and make the money in our purses shrink then shopping will not be so depressing.